Damn, what just happened !!! What just happened right now ?? One of my friends called me and asked me to check my CodeChef account. When I did, I was literally surprised. The rating distribution bar chart changed its form completely. However, in my case, it is still a mystery. I am penalised for an identical solution submitted by someone called @kapil_srivatsa, who lives in Chandigarh, over 1700 km away from where I live. How on earth could he possibly obtain my code, when I code completely offline, on Netbeans, in my personal laptop. His submission date is 10.11.17 while mine is on 04.11.17. Even if someone has to be penalised, then why me? He used some unfair means (I don’t know what) to obtain my solution and submitted it after almost a week. They dropped my ratings too. I gave them an explanation too still, they dropped my ratings. @admin this is not fair and please retrieve my ratings before the long starts. You have been stuck by what we call “Plagiarism Hammer”. I usually dont talk on these matters but for your case, I think I should make things clear. What do you mean by surprised? EVERYBODY caught by the MOSS judge under plagiarism is sent a mail regarding that. @admin asks for their justification so that false positives are eliminated. You got the chance to prove your innocence. And by the way, I did have a look at the codes. Only the variable names are different. In fact, it feels as if someone copied your solution and pasted it with variable names changed. We cannot call this “co-incidence”. Admit it, this is pure nonsense. If this argument had any credit that “because of hundreds of km distance, they cant plagiarize my code” then we wouldn’t be needing MOSS. In the age of Internet (and ideone) everything is just a few clicks away. Your case seems to strongly suggest that your made your code public at ideone or any other online compiler. Or perhaps sharing it with friends on any messaging device. His submission date is 10.11.17 while mine is on 04.11.17. Even if someone has to be penalised, then why me? He used some unfair means (I don't know what) to obtain my solution and submitted it after almost a week. Both are penalized because making solutions public like this does an irreparable damage to fairness and spirit of contest. With due respect, if the argument you sent her was “We are so far, how can he copy my code?” then I can see why you were not spared. If your codes are found identical, its your responsibility to get in touch and provide strong evidence. If you feel you are innocent, get in touch with them and explain your PoV. Dont do that if its otherwise, with years of expertise she can easily distinguish between honest guys and liars. so finally codechef developed a good plagiarism checker ! codechef should suspend accounts of all those involved in multiple plagarism ! They dropped my ratings although both were my own accounts.I gave them the explanation why i created two accounts back then still they dropped the ratings.Damn,My rating dropped because of my own code. @admin please look into this.I can prove you that they both were my account and i have an explanation why i created that.Please give back my ratings.It really feels embarassing when it is showing “Plagiarised in X competition” even when you didn’t. @ista2000 Don’t take me wrong. “Rating ka bharta bann gaya xD” Cannot control laughter yet. I received this mail and my ratings were dropped- We will be dropping your ratings and disqualifying all the submissions of January Cook-Off 2018 on grounds of using false practice during the contest. We found few of your codes similar with one another user. Here are the two solutions we found same. If you open them you can clearly see that the other person’s code was different from mine apart from variable names which were kept same as the question and reader(input) class which I had taken from GFG. So, @admin, @vijju123 please take a look at it and resolve this as soon as possible. In Aug17 I was new to competitive programming.During Aug17 contest i had given my code to one of my friend. in 1 Feb 2018 i got an email that your have been Plagiarised in Aug17 and my ratings have been dropped and I accepted it. But Now in April Long Contest My ratings have been dropped again saying you have been Plagiarised in Aug17. Again ? why…??? I have already paid for Aug17…Now Again for Aug17 ??? should i pay for my Aug17 mistake everytime…??? in every contest ??? I got a message that they are dropping ratings for feb18,but this thing was already sorted out,as i wasn’t found guilty,and they also restored my submissions back then,so why again this? OH GOD, i am Safe from "Plagiarism Hammer"
2. I have one scenario in my mind-- for example, while solving long challenge problem, if i lernt any new concept from net (assume GFG)… SO what to do then? 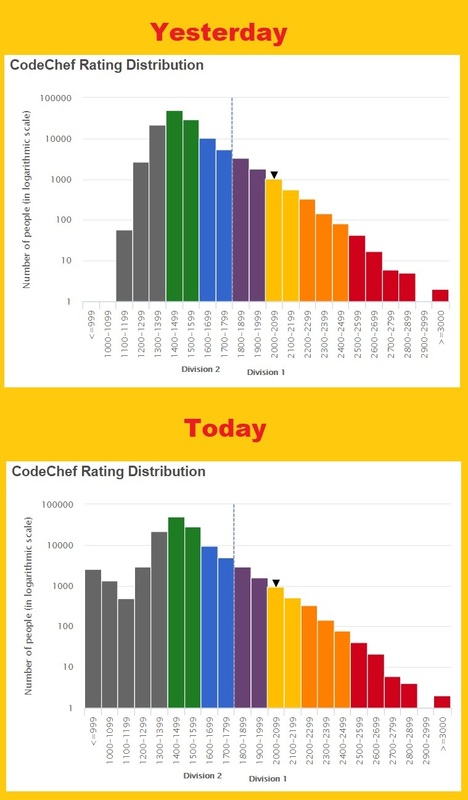 On 1st Feb,2018 I received a mail from codechef that my rating will be dropped because one of my solutions from january cook-off is similar to @pankajgarg9211 code. When I checked both solutions for the reason, it was both of us code in java and use fast i/o reader which I took from geeksforgeeks. Other than that the question had no major logic that may require different approach. I gave a proper justification to the mail with all the reasoning why i should not be penalized but I got no reply and my rating were dropped too. It took me 4 months to get to 4 star and now suddenly I am 1 star that too without any mistake. Please help @admin @vijju123 . Ok, I admit distance doesn’t matter. But isn’t the punishment too harsh? For example, take a look at @hruday968, a division A coder whose rating is way below a beginner. Will ping them to see your case a bit more sympathetically. I talked to them. You really ought to read contest rules! Participation in a contest with two accounts is a very serious offence, especially if you took reward from both of them. Leave ratings aside, it can be a reason to block your account as well. However, @admin is willing to hear you out again. Please contact help@codechef.com and mention your justification (which you gave earlier), link to your main account which you wish to keep, links to ALL alt accounts for suspension and a formal apology over the issue, with confirmation that you wont repeat the offence again. what the hell ?? Even my ratings are dropped ! Today is the “Plagiarism Hammer” Day. I can see account all over with rating 0. Or ~ -500. Based on number of offences. Even the verdict of IOPC17 are being given now. I got plagiarised for something that wasn’t cheating at all. My friend was submitting his code through my laptop but mistakenly submitted it through my account and then from his own. I wasn’t participating in the contest, got a score of 10 in FEB long + rating drop.